I’m not terribly keen on Martin Amis. I am fairly sure I’ve not read any of his books. So I’m basing my lacking keen-ness on what I know about his person. I could object to his fame. Or to the fact that he probably earns a sizeable amount of money from writing. The one thing that would never have ocurred to me to do, is suggest he should stop writing books. I don’t think he should. It’s what he does, and according to some people he is pretty good at it. I liked some of his father’s books, so I accept that Martin most likely has some talent in that direction. He writes. People read and like and pay for the pleasure. That’s fine. But if your name is J K Rowling and Harry Potter made you more money than most of us can begin to imagine (and I speak as someone used to handling lots of money; just not my own), then it appears it is OK to suggest she should give up writing, and leave her window of opportunity to a few other needy authors. Why should she? I like the fact that she clearly enjoys writing so much that she does it even when she doesn’t have to, in order to feed and clothe her children. Especially now, when she must have discovered that she will get lots of flak if she publishes another book. I’ve not read Hilary Mantel’s books either. I have nothing against Hilary, who I’m sure is nice. But I probably won’t choose to read her books while there is so much else I would like to prioritise. She wins prizes. A lot. And while it would be lovely for other writers to win as well, I don’t feel we can suggest that no one should award Hilary any more prizes, in case it upsets her peers. Or that she stops writing in order to prevent literary judges from praising her work. Some people don’t want to earn money. Or so it seems, in this crazy world. Just like I give you my witchy musings for free (would love to charge if I could), Damien M Love is doing his level best to let you read his latest short story for free. Except the big bookshop in the (cyber)sky will only let big publishers give ebooks away for free. Small Damien didn’t want to give up, however, so he is using the loophole of being allowed to offer something to download for free for five days. Starting today. So get shopping! It won’t cost you anything but your peace of mind. 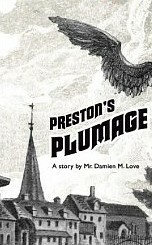 And that’s only if you read Preston’s Plumage, a nice (no, it isn’t) and short (yes, it is) story. It is short. It is good. It is creepy, in an amusing sort of way. It’s about a not very nice boy not called Preston. You could say he’s dim, even. He’s got a granny. There’s a fence. And a major splat. Don’t worry; it will soon be over. And you won’t have paid for it, unless you wait until after Monday, and thwart Damien by paying good money for his little story on how crime pays. Or maybe not. I must be careful. Very careful. If I’m not, you’ll find Ebony McKenna has taken over as chief Bookwitch. Which would at least mean you’d be well entertained. 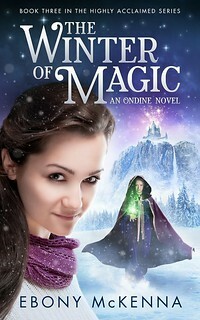 As you may have noticed in yesterday’s review of her third Ondine book, it is an ebook. Below is her background story as to why. ‘I hate orphans. Not actual orphans (poor loves) but the trope of orphans in fiction. They started in fairytales and never went away, did they? The loner who has to face the world – alone – with no parental figures to offer sanctuary; the plucky victim of circumstance who wins the prize based on their sheer goodness/magical abilities/discovery of the elixir. Orphans may have reflected the times they were originally from – mothers who died in childbirth, parents who died in battle or from the pox – but they’re an anachronism today. Which is why I made sure Ondine wasn’t an orphan. When her story first crashed into my brain she was an orphan. Because I picked that low-hanging fruit. But as her character became flesh and blood she grew a family. Two older sisters and parents who treated her like a baby, plus a batty great auntie slash mentor. Love and conflict all rolled up together. Plus, she worked in a pub, surrounded by people. Family, magic mayhem and a talking ferret. I’d captured lightning in a bottle. Ondine and her sequel found generous parents at Egmont in the UK, who doted on her, educated her and gave her the prettiest clothes. They sent her off to the ball bookshop, in hope of finding true love with readers. Many readers did love Ondine. Laika films showed interest in adapting the story for animation. Alas there were more books that were prettier, had wealthier suitors, were more glittering . . . and I’m clubbing this fairytale analogy to death. Ondine had two big adventures in the bookstores in the UK and Commonwealth, but all the love and care in the world wasn’t enough to guarantee a third outing (let alone a planned fourth). Around this time, bookstores were closing and the GFC was kneecapping everything. Times were bad, especially for authors. My anti-orphan series became an orphan. If my life were a book, this would be ‘the black moment’, where all is lost and love is not enough. After gobbling chocolate through a funnel, it was time to look at options. The first step was to take advantage of ‘the rest of the world’ rights I’d retained, so I could self-publish the first two Ondine novels as ebooks into the USA, Russia, China, Japan and Moldova (which has eerie similarities with Brugel, where Ondine is set. For starters, neither has won Eurovision). The thing about self-publishing is you have to do it all yourself. Which means hiring everyone to do the things an author can’t do. Fate had not completely given me the middle finger; I found an editor who used to work with Egmont, who was now living in my home country, Australia. Naturally I hired her to edit the next two novels in the series. I hired a cover designer to give the series a stunning new look. I hired a formatting company to crunch the pixels into shape so the novels would be available everywhere good downloads were sold. All the while I kept writing, because that’s what had gotten me into this fix in the first place, and it would be what got me out of it. Now the Ondine ‘trequel’ is available worldwide. The Winter of Magic has me brimming with tears of joy. Relief is in there too. Terror gets a mention – it’s always scary putting a book out there into the world, however it’s published. I get it now. Ebony McKenna is working her way through the seasons. We did autumn three springs ago (she’s from Australia. She’s bound to get things like that ‘wrong’), and now it’s Christmas (with the before and after, so almost right) and it’s cold in Brugel. Very cold. Especially with the electricity cuts. The Winter of Magic, the third book about Ondine and her beautiful Hamish, who is only occasionally a ferret, is out as an ebook, which means you can do amusing things with the lovely footnotes. Ebony said to tap the screen, but no amount of tapping the Resident IT Consultant’s Kindle did me any good. Was she pulling my leg, or is my equipment no good? Not to worry, the footnotes come at the end of each chapter, and if you have a good memory, you will even remember what they refer to, by the time you get to them. If you’re waiting for Hamish, you can’t wait too long. Three years is obviously far too long a gap, but you will do it for Hamish. I mean Ondine – of course – because she is the main character here. A witch. Luckily for her, most of her witchery must be done by kissing Hamish. Such hard graft. They are back with Ondine’s family, working hard in the pub. Her sister is getting married, and her great aunt is poking her nose into everything. The Duchess is trying to make herself popular, while town is filling up with witches (it’s time for the CovenCon), one of whom is a very bad witch. This is such fun. Again. I recommend this book against the dark depressing times we have to suffer through before it’s summer, or at least spring, again. The seasonally obsessed Ebony seems to plan to end the series (which personally I thought was a trilogy) with a spring themed fourth book. She had better be kind to Hamish! 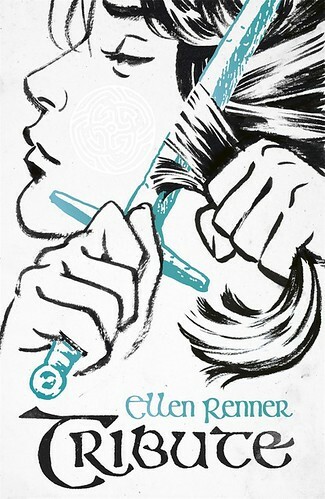 Tribute is a terrific new fantasy novel by Ellen Renner. It’s another one for my best-of list in December, and I’m so excited I don’t know what to do about waiting for the sequel. There has been no mention of a sequel, but there has to be one. And in my opinion Ellen should be a household name. She obviously is in this household, but I would like her to be really famous. And rich. Not that I imagine she could write faster with more money, but still. A Tribute is a slave belonging to a Mage, and Zara was given Swift when she was a child, and then her father, the Archmage, killed her Tribute when they became too friendly. Her revenge was to join the resistance, the Knowledge Seekers, giving them information about the ruling Mages. As with so many magical settings, it doesn’t help that a character can do all sorts of magic, like entering the mind of animals – and sometimes of people – flying, and so on. Because whatever you can do, someone else can do to you. And the Archmage is more than happy to do the most unspeakable things, which is why Zara hates him. When her father takes a hostage from another group of people, Zara ends up needing to do a lot more. She has to break with the Mages and go against her own people and join forces with the others, where not all are sympathetic to a Mage joining them. This is civil war, it is slaughter of hundreds of innocent people. It is very cruel. But it is also a tale of friendship and trust across boundaries between different people. It’s very exciting, and not everything has been resolved by the end of the book. Hence my impatience. Who knew Philip Pullman has had dogs? Yeah, I suppose you all did, except me. He doesn’t strike me as a pet person, somehow. But he has had dogs. Three, of which two were very stupid, according to the doting Philip. 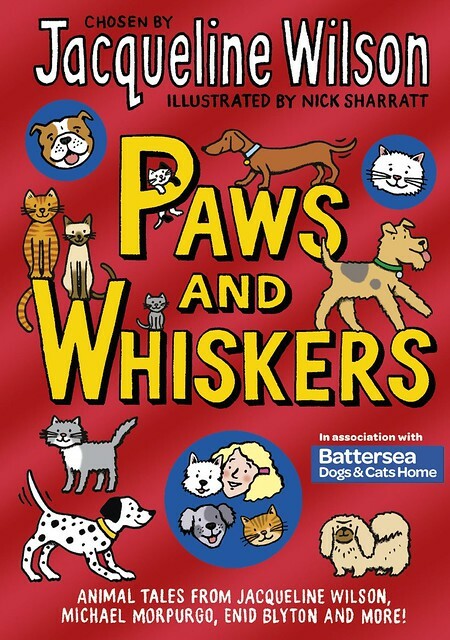 I learned all this in Paws and Whiskers, which is an anthology about cats and dogs, chosen by none other than Jacqueline Wilson. She wrote about her own cats, and they sounded so lovely I was halfway to Battersea and its Dogs & Cats* Home before I remembered I don’t want a pet. Patrick Ness is there with his much missed Manchee, along with countless expected and unexpected authors who have had pets, or who have written about them. Some pieces are excerpts from books, and other stories have been specially written for P&W. The really good thing with this kind of selection of writing is that if you love Jacqueline (and who doesn’t?) you will discover new writers and their work, simply because if it’s good enough for your hero, it will be good enough for you. Illustrations – as nearly always – by Nick Sharratt. *Some of the proceeds from the sale of this book go to the home. Is that an avalanche I hear? Do they help? Those reviews you see when you shop for books online. Do they? Or is it just reassuring for the author of a book to see many reviews, hopefully mostly positive? If I wasn’t reviewing books on a blog like this, I would most likely put up a lot of reviews over there instead. As it is, I do a few of them. I don’t have time for more, because I tend not to be able to use the same reviews as I write for Bookwitch. They are often in a style that wouldn’t work elsewhere. But then I get told by authors how valuable the shopping site reviews are. Some authors actively ask people to post a review once they’ve read their book. So it is at least perceived as useful. When there are truly awful reviews on the shopping site, I can see that having a more favourable one added will balance things somewhat. I assume it also matters more if there are only a few reviews, whereas some books have more reviews than I as a potential buyer would ever want to read. Which brings me to the question whether my reviews here make a difference. I just don’t know. Sometimes readers leave a comment to say they will definitely buy the book now, or that they have ordered a copy, and occasionally they report back later to say what they thought of the book. But that’s just a handful. No one will eat well off that number of sales. On the other hand, perhaps I start avalanches of book buying in silence. I hope I do.